YCN is a network of youth film festivals, organizations and film/media teachers that promotes and improves filmmaking by young people. YCN works to empower young filmmakers to tell their stories by giving them tools and perspectives. YCN’s vision is - through international collaboration - to bring the young filmmakers and their stories to an international audience. The ultimate goal of this network is to enrich European film culture. 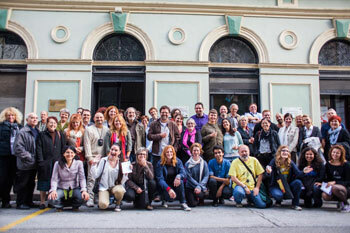 In September 2013 representatives of youth film festivals and mediacenters from 15 European countries met at the international festival of high school film ”Four River Film Festival” in Karlovac, Croatia. There they jointly founded the “Youth Cinema Network”. It is a network for European youth film festivals and mediacenters whose aim is to improve the exchange among member institutions and support youth film and media pedagogy. The Network consists of partner festivals, organizations and associations which actively work in the area of youth filmmaking. It is imagined as a unique platform with a joint web page. The main goal is to empower European youth filmmaking, to encourage young filmmakers in making films professionally and to provide them with tools and knowledge to tell their film stories on film festivals across Europe. Not only is there a web page which will transparently show activities of all organizations included in the Network, but there is also a Facebook page which will match the needs of young people who spend most of the time on social networks. This is how everybody will be able to regularly get information about new activities in the Network, communicate with all the Seminar participants, etc. How does this help you as filmmakers? Practically: when you enter a film, we will try to spread it in the network. The network will also make it easier to apply for funding for international workshops and advanced training. We are planning on awarding an international prize for young film, designed to support outstanding talents. And, very importantly: we want to enrich European film culture by supporting especially authentic films, unusual and daring, which are in contrast to the mainstream in cinema and on TV.